Make barbecuing a pleasure with the multi fuel One Plus stone barbecue. 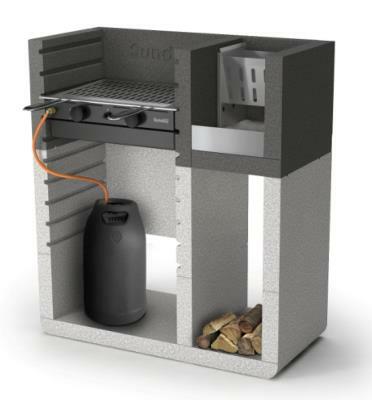 You can cook on gas with the 2 burner insert with 3 cooking heights for the large 60 x 40cm cooking grill. If you fancy cooking over fire just remove the gas insert and add charcoal or wood. Side brazier for burning wood to keep you supplied with embers for cooking on the grill. Includes 2 burner gas BBQ. Versatile: cooking with charcoal and the convenience of changing over to gas. Finished in granulated white Carrara marble hearth and "gray"